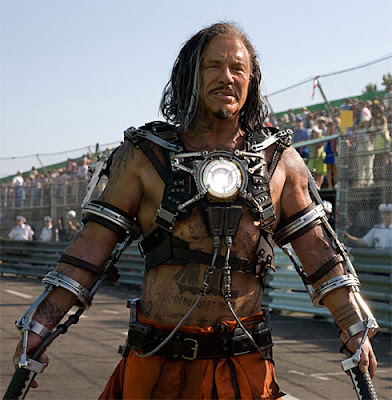 The first thing you might say when looking at Rourke in character as Whiplash is, "isn't that the same power pack on his chest that Tony wears?" Favreau answers that question specifically. He said, "The technologies are definitely related. That's part of the core theme of the film." Favreau continued, "Ivan has constructed his own version of a suit." Mickey Rourke commented on his role by saying, "Whiplash is going to light them up!" Favreau also hinted that his Whiplash may be a bit different from the comic. He said, "We like to play into and against the expectations that people might have, so we mixed it up a bit." The last thing Favreau talked about concerning the character of Whiplash, was the decision to go with Mickey Rourke. He told USA Today, "It was very important that the villain be as compelling as can be. … Once I thought of Mickey in that role, it made me understand how to shape the story."